Our Offset Drawer Magnet fits on our Standard Feeders to raise the material hopper up 6 inches and back 5 1/2 inches for additional virgin material hopper clearance and greater protection when running regrind. It has four stainless tubes with ceramic magnets, arranged to make the material flow over and around the magnets. 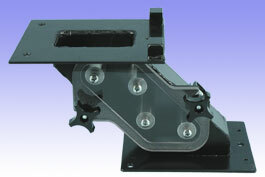 The 1/2" Lexan® window is machined with a step that fits into the housing, thus eliminating the need for a gasket.